A pack of 50 wipe-clean cards with fun activities to make time fly on a journey. Includes mind-bending puzzles such as crosswords and mazes, fun games like connect four and lots more exciting activities and doodling pages. Includes a special pen to write on the cards. 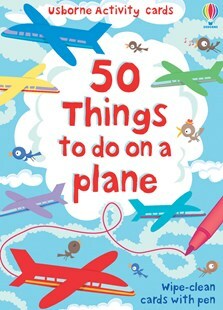 For flights Usborne's "50 Things to do on a Plane" will keep them occupied, rrp £5.99, while the Top Trumps range is great for older children, especially if you're willing to join in. 50 things to do on a plane is a great mix of games, jumbled letters, drawing and much more. There are lots of the colourful, attractive cards which children of five or so could enjoy, while children of nine or ten would just like everything. The only snag I can see it that you might drop all the cards on the plane floor.